Two of the biggest lies in aviation: "I have the field in sight" and "I don't want to fly for the airlines." Whilst most people want to fly for the airlines, very few will actually get the opportunity. Most pilots as well as casual bystanders are fascinated by big airliners and wonder what they are like to fly. My experience flying a DC9 on a test flight was, "Can I actually do this." the captain on board said, "Don't panic, it flies like an aeroplane." To a certain extent that is correct but there are some rather significant differences. Not to mention, a DC9 is somewhat smaller than a Boeing 747. 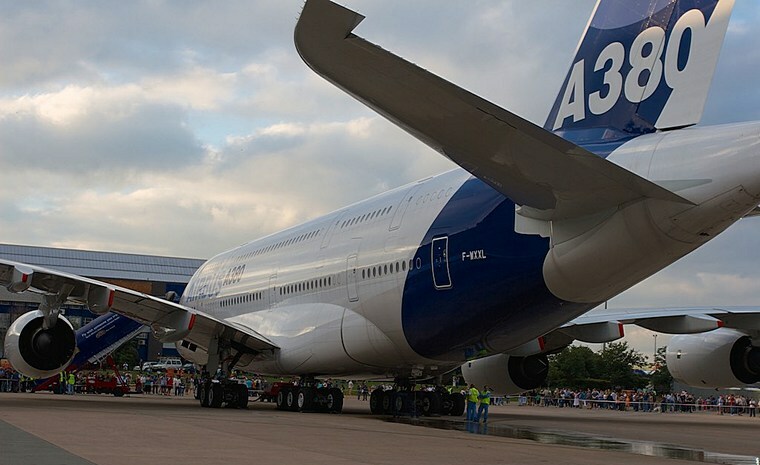 Aside from the new Airbus pretender, they don't come much bigger than a 747. I decided that the best way to find out what it's really like sitting in the pilot's seat was to speak to a pilot. One with several thousand hours on type. Karl Jensen is a retired captain who has 27 years' experience on Boeing 747s. A fully loaded 747 on a long haul flight can weigh as much as 400 tonnes, of which 250 tonnes is fuel. An Airbus A380 has a maximum take-off weight of 650 Tonnes. You might think that after flying 747s for a while, you would get used to the size and it would become as easy to handle as a Cessna 172. According to Karl, this is not the case. The 747 never feels smaller than it actually is even after 27 years. The pilot's eye level when sitting on a 747 flight deck is exactly 32 feet above ground, regardless of their physical size. There is a marker on the side of the cockpit just within the pilot's peripheral vision. The pilot adjusts the seat so that his eye is at the level of the marker. The seat is above the 5th row of seats in the cabin below. Every pilot's eye is in the same position and has exactly the same perspective when flying. The seat position is also important to prevent optical distortion and double vision through the curved windscreen. When the aircraft is in the air its physical size is of no real consequence. It's on the ground that you really appreciate how big it is. From the cockpit neither pilot can see the wings and, as you can imagine, the aircraft has a significant wingspan. There is a yellow line painted along the taxiway which must be followed so that the pilots will be sure never to bump the wing against anything and the landing gear will never run off the tarmac. Both the captain and co-pilot can steer the aircraft on the ground using a tiller. Taxiing is all the more difficult because the main gear is 100 feet behind the pilot's seat. Most airlines recommend that the autopilot is engaged at any stage of the flight which is 400 feet or more above ground. The auto flight system can fly the aircraft more accurately than the pilot. Although a B747 is a magnificent aircraft to hand fly, the level of concentration required means that this can only be done for relatively short periods of time. The autopilot, on the other hand, can maintain accurate control for many hours at a time. So does this mean that once the autopilot is engaged the organic pilot sits back and reads the newspaper? Absolutely not, nothing could be further from the truth. The pilots still have plenty to do. One of the most important jobs of the pilot is fuel management. This involves choosing flight levels that will optimise the fuel usage. Flying higher where the air is thinner will improve the efficiency of the aircraft. The weight of the aircraft will, on the other hand, restrict the altitude that can be achieved. Climbing to a different level in order to find a tail wind can significantly reduce the amount of fuel used. A good pilot will continually monitor the weight of the aircraft as fuel is burned and select the best cruising altitude for maximum efficiency. Navigation is also quite important. The modern flight management systems do take care of navigation but pilots continually monitor the system. The flight management system will tell the autopilot where to fly but it won't know if the aircraft is not making good time so checkpoints are created approximately 30 minutes apart. At each checkpoint, the crew ensures that the aircraft is on course and maintaining the optimum speed and the fuel consumption is according to pre calculated values. A good pilot likes to keep the passengers as comfortable as possible. The aircraft is pressurised so that all on board can breathe normally even though they are at an altitude where air is too thin to sustain life. Keeping the cabin pressure constant will prevent passengers' ears popping. The average passenger feels uncomfortable if the aircraft climbs or descends too steeply. The optimum climb rate for passenger comfort is 400 feet per minute. Passengers often feel unwell if the aircraft banks too steeply. As a general rule any commercial airliner with passengers on board shouldn't bank more than 25 degrees but 15 degrees is the recommended bank angle for most airlines. The technique for landing a 747 is very similar to landing a Piper Cherokee. However, there is one very significant difference: accuracy. Floating a light aircraft half way down the runway usually only results in a slightly red face. Unlike a 747, which will quickly run out of runway with touchdown speeds around 140 knots and with its maximum landing weight of 287 tons, there is a lot of kinetic energy or inertia to dissipate. There is very little margin for error when landing a 747 and the approach speed needs to be spot on. Not to mention the added pressure of 400 passengers all waiting to clap if it's a good landing. I've never really understood why they do that. Did they not expect it to be a good landing? On a runway that is slippery, on the other hand, the pilots' will put the aircraft down more firmly to enable wheel braking to be effective as soon as possible. This is of course a very brief overview but I hope it gives you an insight into the world of an airline pilot.